Millennials, people love making fun of them. 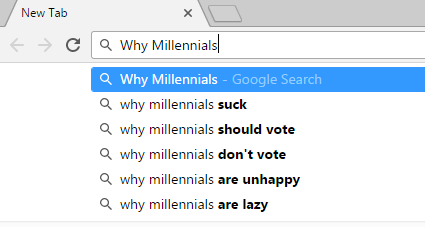 The internet is riddled with evidence - from the countless rants and articles trashing the generation (one even written by a Millennial) to a YouTube video satirically asking people to sponsor a Millennial to even Google's search bar revealing how people really feel about them (see below). But it's a growing generation that in less than 10 years will account for three in every four workers. So if you plan to have employees in the coming years, you'll need to know how to effectively manage and work with them. We know there's a cloud of mystery that lingers around this generation. 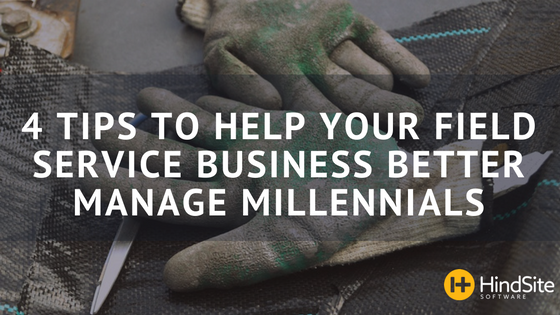 That's why we came up with four tips to help your field service business better manage your Millennial employees. It might take some adapting but you’ll be surprise to see that they have the potential and skills to become the type of workers that boost your bottom line. Millennials LOVE collaborating and working in groups. This is great if your business has crews and a model that generates frequent and natural collaboration. But if not, find where you can include some level of cooperation and group discussions especially when it comes to making decisions. And speaking of decision-making, Millennials prefer to be involved. Or at the very least shown why the decision was made. This might seem fussy or unnecessary but in the end, it makes them feel valued and more likely to carry out your decision. Takeaway & Application: Take advantage of their ease and comfort in working in teams. It can be a benefit to most businesses even if it doesn’t exactly fit your model. If you’re a boss or manager create a collaborated and employee-centered environment. As former athlete and lifelong fan this makes me think of "a player's coach". You've probably heard a NFL Announcer say - “Well you know Bob; Pete Carroll has always been a real player's coach” - at least a handful of times. And you know what, the guy has won two National Championships and a Super Bowl, so it might just be the adjustment that puts your business on the winning track. First it was the Nokia Brick, then the Motorola Razr and finally the iPhone - no matter their background almost every Millennial grew up with technology at their fingertips. This can be intimidating for Generation Xers and Baby Boomers. Keeping up with technology and the latest trend is exhausting. It’s always changing and evolving. But embracing and integrating technology will not only make your business more efficient. It could attract a new generation of employees. The truth is if you don’t adapt and embrace technology you’ll eventually get left behind. The list of examples is endless (you can find proof here, here and here). But let’s take a look at the story of Blockbusters well known fall from grace. In 1991, Blockbuster was worth $8.4 billion and was a publicly traded company by 1999 - mostly due to its reliable revenue from late fees rather than the strength of its business. Ironically the idea for Blockbuster’s anti-late fee competitor Netflix all started when a guy named Reed Hastings forgot to return (the Kevin Bacon classic) Apollo 13 and was slapped with a $40 late fee. In 2000, Blockbuster turned down the chance to buy Netflix for $20 million and two years later Netflix went public and kept growing (and growing). It wasn’t until 2005 that Blockbuster decided to finally adapt, introducing a “no-late fee” offer to its customers (this eventually lead to lawsuits, but that’s a whole other story). Five years later Blockbuster experienced a $1.1 billion decrease in revenue and was delisted from the NYSE. The same year Netflix reported a 29% revenue jump of $2.16 billion and their stock price increased 219% to $175.70 a share. That September of 2010 Blockbuster filed for bankruptcy. Game. Set. Match. Takeaway & Application: Compared to other industries, the field service industry is known to lag a bit behind when it comes to technology. But this is a good thing for proactive owners. It means you have a larger window of time to adapt and adopt new technology before your competition does. And embracing technology gives your business the chance to attract and retain more employees from the growing labor force of Millennials. Ideally, it’d be great if you were using a software and field app like HindSite Solution, Field Central or something similar. But if it’s not the right time or fit, it’s still a good idea to incorporate some sort of new technology. It doesn’t have to be that big of a leap, it can be something as simple as text communication. Millennials constantly want feedback about how they’re doing their job. But like their view on groups, they want to be treated as unique individuals, not just another of many employees. So, no blanket or one-size-fits-all statements. Instead make it unique and personalized. This doesn’t mean you should baby them. Provide them with what they need to hear, not what they want. They're seen as the sensitive generation, so most think Millennials are only looking for praise. And that might be true for some but it will lead to employees having a false sense of satisfaction and hamper productivity. Not every Millennial will respond well to direct and constructive communication and that’s fine. It just shows that they're probably not the right fit for your business. Most field service businesses can’t afford having their managers and owners waste time tip-toeing around feelings during employee conversations. Plus, this type of straightforward approach provides much needed structure for a generation prone to unnecessary multitasking - which can lead to ignoring priorities and the boundaries of their job. The more you understand the way they operate the better you can guide and confine them to the task or job at hand. Takeaway & Application: Set-up and plan recurring individual meetings. Whether that’s weekly, bi-monthly or monthly is up to you. Tell them what they’re doing well and what they’re not doing well. It’s a prime opportunity to provide them with much needed structure and focus. What drives Millennials is vastly different than that of past generations. Before people would simply take the job that allowed them to make ends meet - meaning dollar signs were the main motivator not the position’s description or function. When it comes to Millennials, nearly two-thirds would rather make $40,000 a year at a job they love than $100,000 at a job they think is boring. What does this mean for motivating this generation? It means money will only get you so far. And it also doesn’t mean you create an abnormally fun environment that doesn’t align with your business. Instead Millennials are motivated by a sense of progress, the opportunity to solve problems and a broader sense that what they are doing matters. The first two “task-based” motivators are relatively easy for field service businesses to provide. Putting in an irrigation system, maintaining a lawn or plowing snow will naturally offer Millennials a sense of progress and the opportunity to problem solve on a daily or weekly basis. For irrigation companies this could be putting an emphasis on water conservation. Grapids, a customer of ours located in Michigan, has an “Eco-Friendly” section that catches your eye the second you land on their homepage. Then their Products & Resources page goes into further detail, explaining how each component and part helps conserve water. Takeaway & Application: It all comes down to encouraging the task-based motivators and promoting a business mission that provides the sense of purpose they’re looking for in a job. Being driven by progress means Millennials want to produce results. And combining this with their need to problem solve makes for one hell of an employee. One who won’t shy away from the challenges that come in between them and the end result. Millennials may have their fair share of weaknesses but their motivators, if properly managed, can be a strength to your business. You now know how to manage and tap into the advantages that comes with having Millennial employees. There will likely be a few obstacles and generational gaps to overcome but in the end, you might just realize how this ever-growing generation can energize your business and provide a fresh perspective. If you don’t know how to make your business can attract Millennials check out our Understanding & Attracting Millennials For Your Field Service Business Infographic.